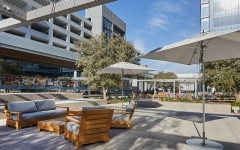 The Boardwalk, located in Irvine, California, is a creatively designed commercial office development that merges indoor corporate environments with outdoor collaboration spaces, resulting in a unique business campus. 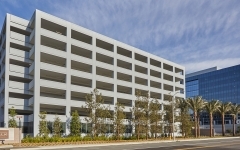 IPD worked closely with the overall site architect to integrate the parking facility into this innovative project. 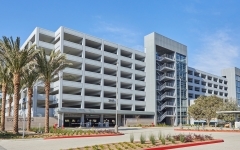 The eight-level structure contains over 2,100 parking stalls, including provisions for valet service as well as self-parking for employees and visitors to the complex. 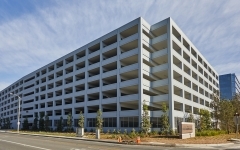 The two vertical circulation cores feature high-speed, glass-backed elevators overlooking the park-like central courtyard and adjacent office towers.